Here's what some of our patrons had to say about Supernatural Events' Ghost Tours, Investigations and Blackpool Ghost Walks. "Fabulous, fun and frightening! These are the best words to describe the tours and overnight investigations I have had the pleasure to participate in. It's certainly a conversation starter at parties! I can't recommend them highly enough"
"The evening was planned well; we were the first youth group to take part on an overnight investigation or a ghost tour and found that the organiser geared the evening towards the young people making it as fun and exciting as possible! I will definitely be recommending the tour to other groups." "I attended a tour at Blackpool Zoo last night and was impressed by the way the event was organised. It was also great that equipment was handed out to aid in the investigations." "On all of these tours the experience is 100% genuine, and the sounds we heard and the cold chill we experienced that night (overnight investigation at the Grand Theatre) cannot be easily explained away. We all (we were in the company of two ladies from Bolton) heard the sound of hard heels on the stage above us, and when I made my way up to investigate found no trace of anyone there. On the staircase entrance to the Spanish Hall I twice saw the clear reflection of a movement in the mirrored wall, when I was looking directly at the area opposite the reflection where there was nothing to be seen. These tours are excellent on several levels. Highly recommended." "Thank you so much for a wonderful experience and a truly amazing night, we cannot stop recommending your tours to anyone that will listen." 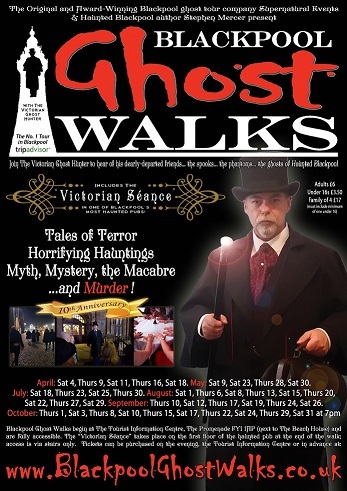 "This was a very informative ghost walk going from the North Pier to the Tower, then onto the Grand Theatre, Winter Gardens complex and back to the sea end of the North Pier. At each stop, information about reported hauntings in the areas was given by Stephen Mercer. If you're in Blackpool when one of these tours takes place, go on it - you'll enjoy it." 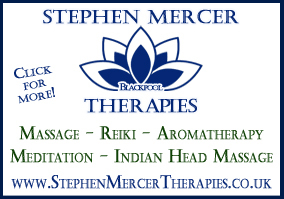 "Stephen, with his warmth and professionalism managed to entertain and keep the attention of the group during his Walk in drizzly Blackpool." A big 'Thank You' to Supernatural Events for an excellent 90 minutes touring some of the famous and symbolic attractions of Blackpool. 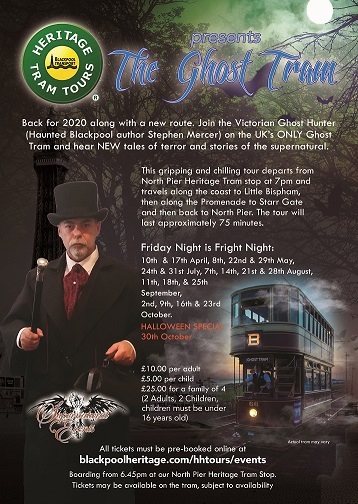 Having spent the last 15 years enjoying events at the Pleasure Beach, the Club was excited to be able to venture away from the thrills of the big rides and experience the chills of Blackpool's spooky past! Blackpool Ghost Walk was an excellent value-for-money experience that appealed to a mixed group of all ages and interests. A definite hands- up from all the group!